The Oakland Creative Neighborhoods Coalition (OCNC) – which brings together cultural organizations, neighborhoods, artists and residents of color – has accomplished many feats in the few years of its advocacy and community organizing in Oakland, a city that locals proudly refer to as “The Town.” From being an integral component in budget wins that led to the hiring of Roberto Bedoya, the city’s first cultural affairs manager in fall 2016, and increasing grants funds for local artists and organizations last summer, OCNC has proven to be a critical community voice and has won on several equitable arts and culture policies in a city that has been lacking in such policy work for more than a decade. Below is a diagram that shows the process of how Oakland’s civic leaders, advocates, and residents informed the development of the plan. A unique and defining feature of Oakland’s cultural plan is its purposely broad nature: by looking at how cultural equity applies to broader policy areas, strategic development of specific policies and programs would center and consider its effects on the culture and identity of Oakland’s residents. “The goal of this plan was to bust the framing of culture within policies wide open, to not see it in a narrow way,” says Vanessa Whang, who authored the plan under Bedoya. She emphasized the importance of looking at “culture as ways of being,” which has broader implications on the cultural aspects of other city agencies and departments. This was an important organizing principle for OCNC in that this frame values culture as critical to one’s identity and broadens their advocacy efforts to the community at-large, who feel the city’s culture is under threat as Oakland experiences rapid change. “The displacement of culture and knowledge – cultural entities, churches, spaces – are part of a systemic erasure of community,” states Barber. The threat of this change is critical to the formation and the work around arts and culture that OCNC has undertaken. 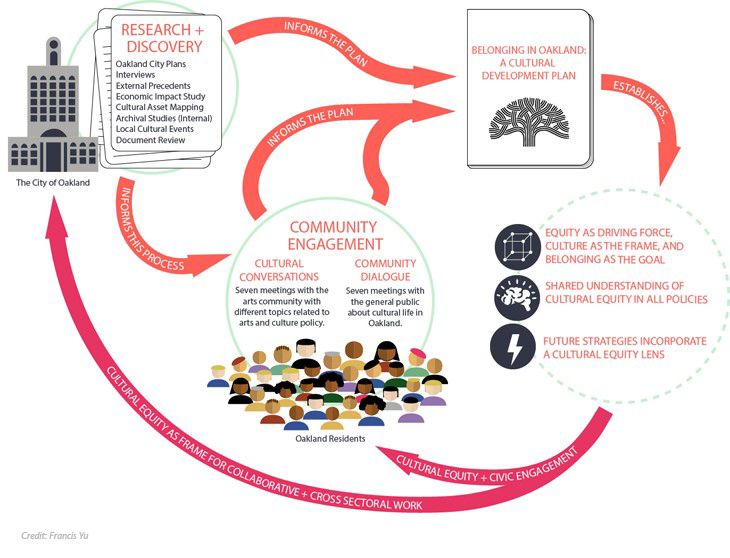 As OCNC moves to its next chapter, a cultural development plan that centers on cultural equity provides a shared language communicating the importance of culture as OCNC strengthens its relationships with other advocacy organizations such as ReFund Oakland, a multisector coalition that organized around the City of Oakland’s budget and was integral to OCNC’s policy wins. OCNC is also currently advocating for the re-establishment City of Oakland Arts & Culture Commission, which has been inactive since 2014.